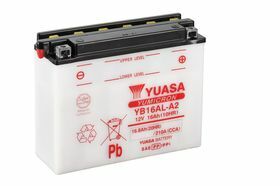 The Yuasa YB16AL-A2 12V 16Ah motorcycle battery provides phenomenal starting power whilst being completely maintenance free. This is a premium motorcycle battery, so there is no need to worry about reliability and quality when purchasing a Yuasa motorcycle battery. Mostly suitable for Yamaha, Ducati and more. Please see Motorbike Fitment tab for the full list.